Shacknews travels the world with Renowned Explorers: International Society, the adventure strategy game that requires intelligence along with might in order to succeed. See what it takes to become the best explorer in the world in our review. Renowned Explorers: International Society takes us back to a time in history when bands of courageous explorers came together in search of fame, knowledge, wealth and fictional treasure. The difficulty of this virtual board game might be hard to hard to believe, given its cartoon graphics and casual presentation. But this is a game that's meant to be replayed over a long period of time, and each failure presents a new learning opportunity. Trying and failing is also a big motivator to give the game another go. The game starts off simple enough. 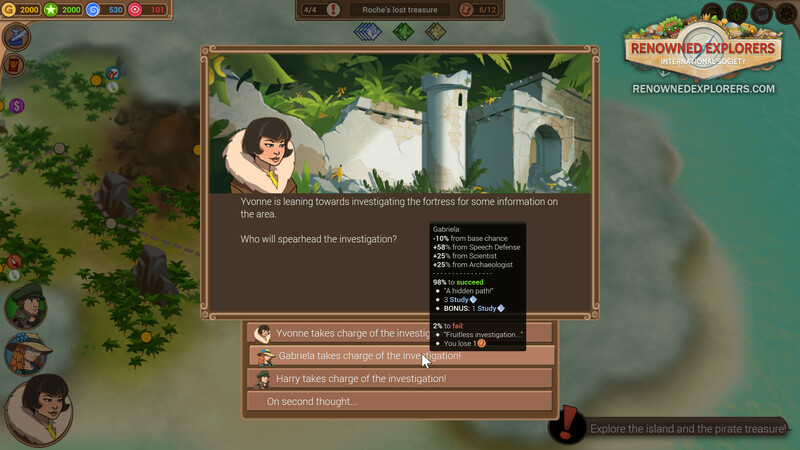 You select three people from a selection of explorers, each with unique strengths and characteristics. There are four types of explorers, so it's not possible to create a completely balanced team, but you can make one to suit your intended approach, as determined by the team captain. For example, your explorer team can specialize in being aggressive and seize treasure by force, or you can try to be friendly or persuasive. There is some flexibility, but it's difficult to build a team that doesn't have some sort of specialty. You build up world renown to become the greatest explorer in the world. To this end, you must embark on five missions of varying difficulty, collect as many resources as you can, and put them to use. These include researching new skills, purchasing equipment, and hiring a small team to help gain extra bonuses out of each mission. Once on a mission, players follow routes to explore areas in search of knowledge, prestige, and treasure. But the catch is that each movement uses up supplies, and you have a finite amount of them. Your teammates will start suffering penalties when you're out of supplies, so it's good to keep a close eye on it and plan your moves accordingly. You can sometimes pick up additional supplies from outposts and villages, but that's not always guaranteed. There are also a number of obstacles that stand in the player's way, such as deciphering a tome or raiding a pirate ship for its goods. These incidents, should you choose to engage them, play out as games of chance. Studying a scientific artifact will require a scientist, and the higher the science skill, the higher the odds are of success. A wheel, similar to that of Wheel of Fortune, spins and you have to hope that it lands on success instead of failure. There are few things more infuriating than watching that wheel spin and seeing it slowly land on the single fail square on the wheel. But that's how it goes, and there's a great sense of elation when luck works in your favor. You're bound to run into natives, pirates, and other potentially hostile people on your travels, and Renowned Explorers features a wonderfully unique combat system. Each character can attack in one of three ways: A aggressive physical attack, a threatening or demoralizing Devious attack, or a Friendly one. Two out of the three involve talking your enemies into submission, and they work in a sort of rock-paper-scissors sort of way. Friendliness beats being mean, Deviousness trumps Aggression, and Aggressive explorers beat up nice folks. Certain enemies are more vulnerable to certain attacks than others, but you also have to consider the best approach to make the most out of your team. Maybe your team isn't very good at being Friendly, which can put them at a disadvantage. The types of attacks employed by players and opponents impact the characters' moods, making them angry or happy. Either direction opens up certain strengths and weaknesses, and explorers need to figure out the best ways to exploit them. For example, one of your characters can do extra damage on an enemy that's scared. Or, being depressed can lower your defenses. Combat gets frustrating during boss encounters, since the game tries to overwhelm you with enemies. Oftentimes, I found that enemies can easily keep up with explorers' movements, making it almost impossible to retreat and regroup at a better position. Speech attacks are the worst, because they can use words from a distance. I often had at least one of my explorers insulted to death by a horde of monkeys within the first turn. In order to succeed, you need to have a strong team and a willingness to take risks. The 5-mission campaign doesn't take very long to play through, even if you don't die all the time. You can either play casually, which allows you to replay fights, or in an ironman mode, where dying means you have to start all over again. Renowned Explorers is the perfect example of a game that's easy learn but difficult to master. I don't usually enjoy games that have a big element of chance, but I like this one. It's too easy to get stuck on a boss, but that's part of what being an explorer is all about. This review is based on a PC code provided by the publisher. Renowned Explorers: International Society is available now for $19.99.